Copyright 2014 ecological Society of America-distributed under the terms of the Creative Commons Attribution License, (CC BY 3.0 AU) which permits restricted use, distribution, and reproduction in any medium, provided the original author and sources are credited. Nonnative species that form novel habitats strongly affect ecosystem processes. The effects of these ecosystem engineers can be both positive and negative but the mechanisms behind their effects are not well described. In this study we determined the relative importance of three main mechanisms by which invasive ecosystem engineers can facilitate native fauna. The engineer may provide new physical structure that reduces harsh abiotic conditions or gives refuge from predation (both engineering mechanisms), or provide a new profitable food resource (a trophic mechanism). The invasive seaweed Gracilaria vermiculophylla is a novel addition to estuarine intertidal mudflats of the southeastern United States. The epifaunal amphipod Gammarus mucronatus is up to 100 times more abundant on Gracilaria-invaded mudflats compared to uninvaded mudflats. Feeding assays, a survivorship experiment and stable isotope analysis demonstrated that Gammarus consumes little Gracilaria and cannot survive on Gracilaria alone. 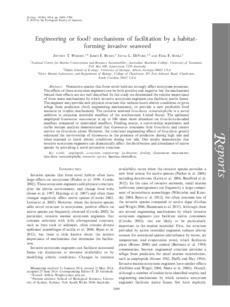 However, the structural engineering effects of Gracilaria greatly enhanced the survivorship of Gammarus in the presence of predators during high tide and when exposed to harsh abiotic conditions during low tide. Our results demonstrate that invasive ecosystem engineers can dramatically affect the distribution and abundance of native species by providing a novel protective structure.